Come OUT to the first national protest of the wars under President Obama. * refuse to investigate & prosecute the war and torture crimes of the Bush regime. The election of the first black president is effectively re-branding preemptive and illegal wars of aggression to make us feel good about them, enlisting us to “serve and sacrifice” for horrors we have no good reason to support. But, we don’t have to go along! It’s immoral to “wait and see” or hope for the best from Obama. If you care about humanity, get in the streets to send a message to the world that there are millions of us who don’t want these crimes carried out. I heard all the CNN reports saying that he was wanting to close the secret CIA prisons overseas. However, if he keeps these extraordinary renditions in place, all that is changing is the place where the prisoners are being sent. I have been a bit out of touch lately (moved to China) so If someone could source the article where Obama says the rendition programs are staying in place, it would be greatly appreciated. Drew Noftle on Sun, 02/22/2009 - 2:38am. VeilLifter on Sun, 02/22/2009 - 3:09pm. New Boss = Same as Old Boss? 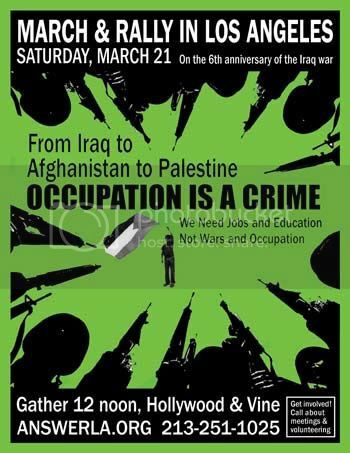 Occupation and Torture are unAmerican. Kevin O on Sun, 02/22/2009 - 4:39pm. RainCheck on Sun, 02/22/2009 - 5:50pm. Los Angeles - All Out for 9/11 Truth! Randy on Mon, 02/23/2009 - 1:12pm.